Folded my white card in half (5" square") and then used the outside edge as a guide from the largest die of the Beaded Circles (Elizabeth Craft Designs) to cut my circle. Scored and folded the front half in half to create the easel. Cut another white circle for the front piece. 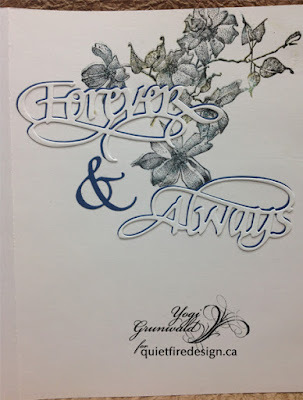 Ran it through my embossing machine using the "Coffee Bean" embossing folder (Elizabeth Craft Designs), inking one side with Distress "Old Paper" and clear embossing after dry embossing. Hit the high points with "Ground Espresso" pad. Adhered to card front. Die cut the largest beaded circle, keeping the negative piece for the floor. 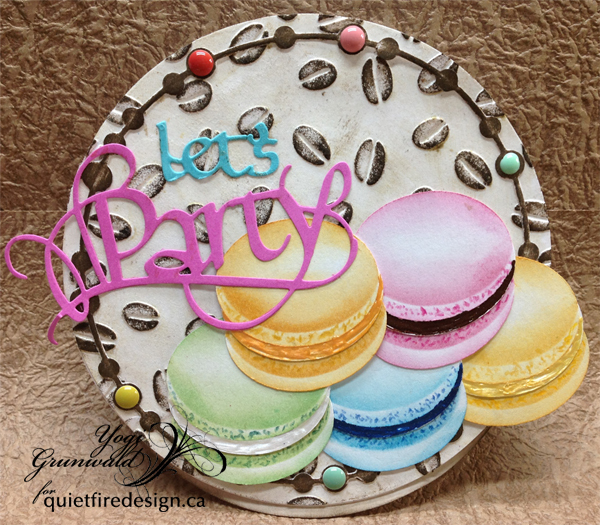 Inked the beaded circle using the espresso pad and adhered to card. 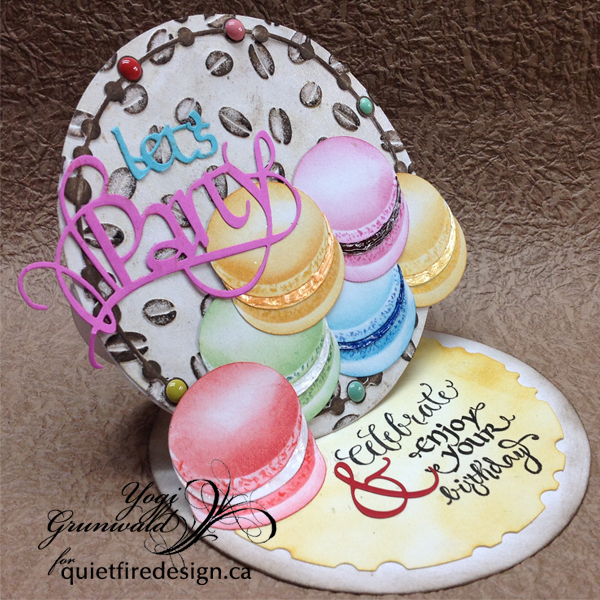 Created my Macrons - see tutorial at bottom. 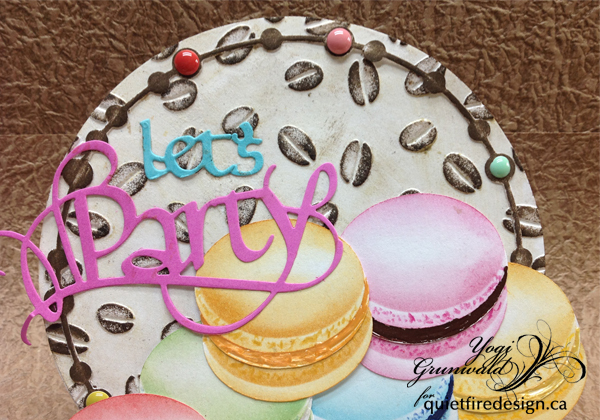 Die cut the party from "It's A Party" from pink cardstock and the 's & "Let" from "Let It Snow" from aqua cardstock, cutting off the bits I needed to create the word "let's"
Adhered all my elements to the front. Adding some colored enamel dots. On the Floor: Sponged the negative of the beaded circle using "Fossilized Amber". Sponged some espresso around the edge of the floor. Adhered the negative piece to the floor. 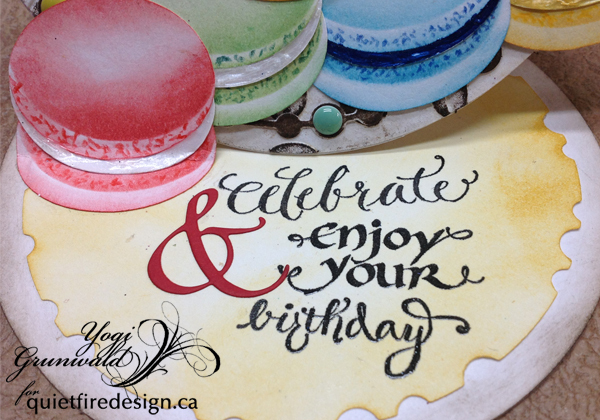 Stamped the words " "Just For You - Celebrate" 4pce set", "Twirl and Enjoy" 3pce set", and "Happy Birthday Plain and Simple" 7pce set, masking off the areas I didn't want to stamp using Versafine Black Onyx and clear embossing. Die cut the "Calligraphic Elements 2 - Ampersand" from a red cardstock and adhered. Adhered the bottom edge of the red Macarons to act as my stopper. 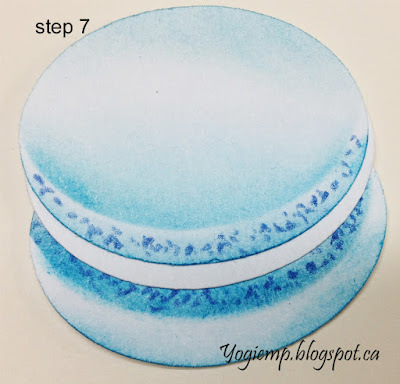 Step 1: Created the Macrons by cutting fat oval shapes (use a die or punch or electronic cutter, or cut by hand...) - you need 3 the same size ovals for each Macarons. 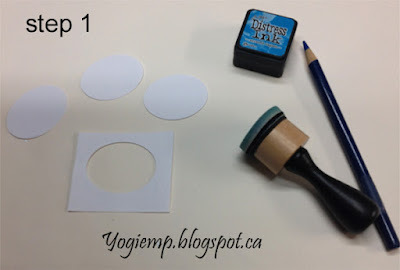 Keep one of your negative pieces as well to use as a stencil. 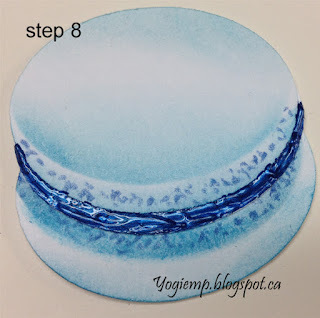 Step 2: Place the stencil approx 3/16" above the bottom edge (you can see this with the open space from the negative cut out), hold the negative piece and your oval firmly and sponge with your meringue color, laying down a heavier color around the edges going to nothing in the center. 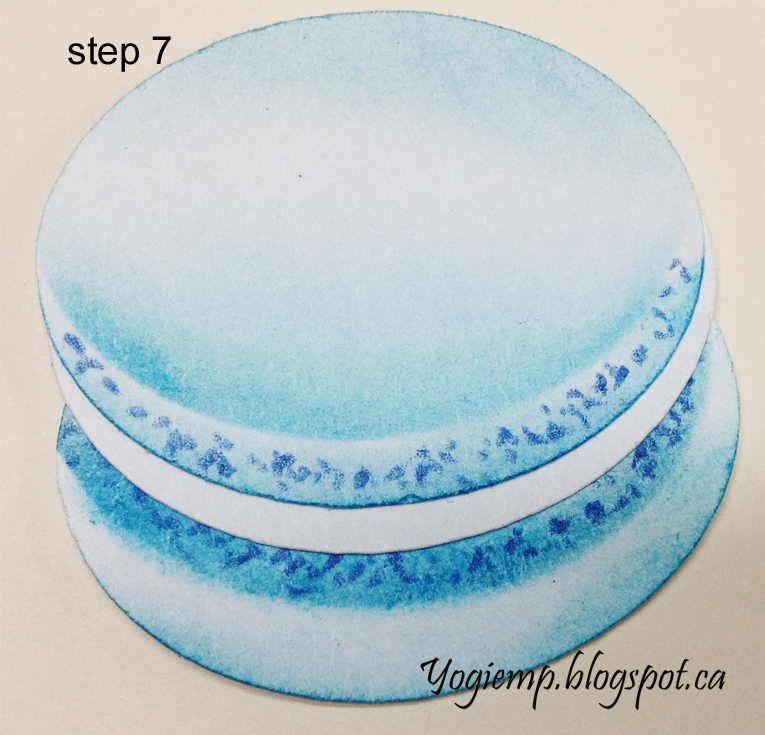 Step 4: then sponge the lower edge where the traditional feet of Macarons is. 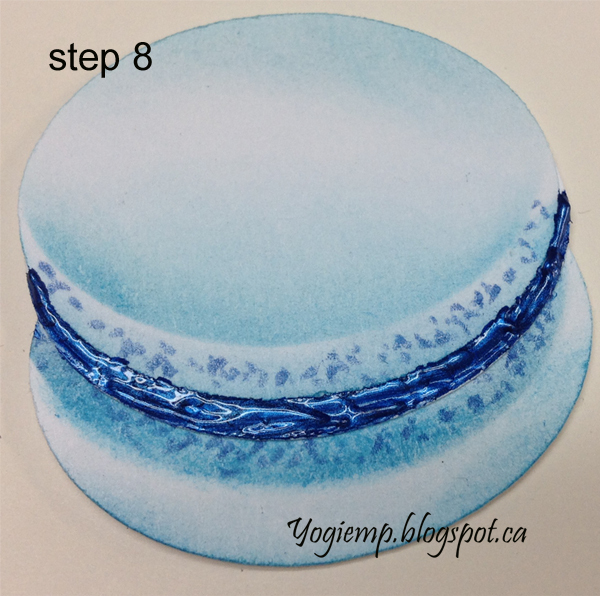 Step 5: Sponge the 2nd oval in a similar way placing the stencil approx 1/4" above the bottom edge and sponge. Remove stencil and sponge the bottom edge white area. 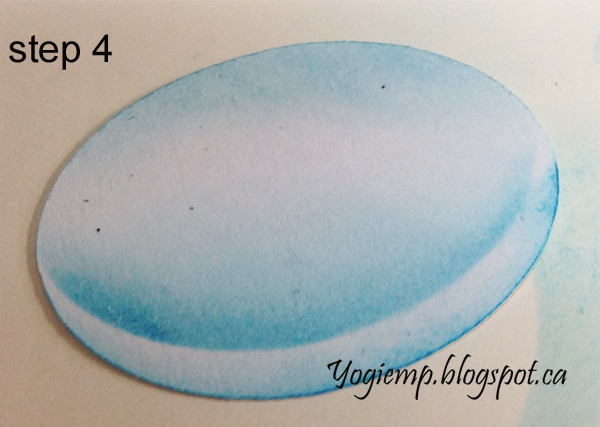 You can color the 3rd oval which is your filling or leave it white and use Viva Pearl Pens or Liquid Pearls to give that glossy filling look. Step 7: Adhere the 3 layers. 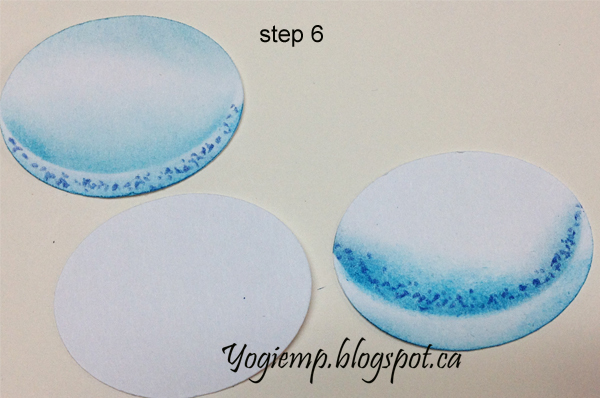 Step 8: add the Viva Pearl or Liquid Pearls in a thin bead. One of my mom's favorite flowers is the rose so I always try to grow some in my garden - but gosh, they are hard to grow properly. In July they are absolutely devoured by those nasty June beetles. Then they have those black fungus, caterpillars - I'm so much better at sticking them on cards! And I have a lovely variety of them - perfect for placing on a wreath around this beautifully lettered quote by Suzanne Cannon of Quietfire Design. 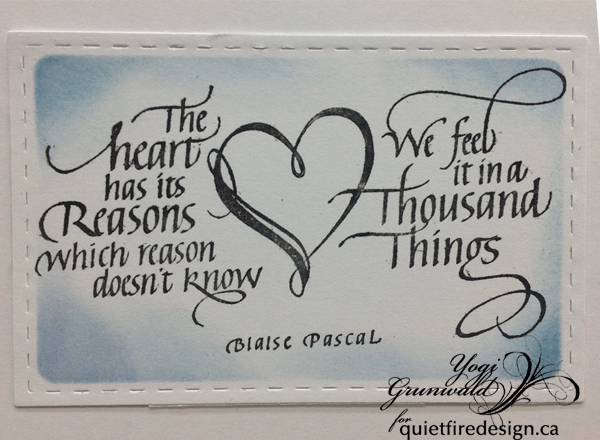 I stamped the quote in black pigment ink and embossed it with clear powder. 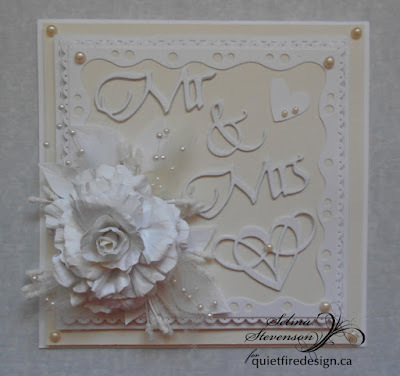 I then embossed my layer with an oldie but still lovely Rebecca embossing folder by Cuttlebug. To add warmth to the card, I then sponged the edges with Tea Dye distress ink. It really brings out the embossing. 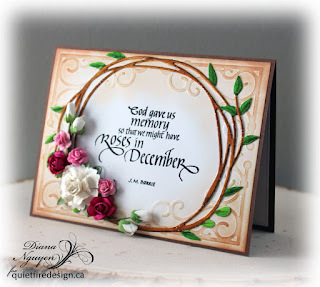 The wood wreath by Spellbinders was colored with Zig clean color brushes and centered around the quote. It's Friday and time for another post celebrating our team mate Yvonne on her wedding this week. We are all so happy for her and I am sure it is going to be a wedding to remember for the rest of their lives. 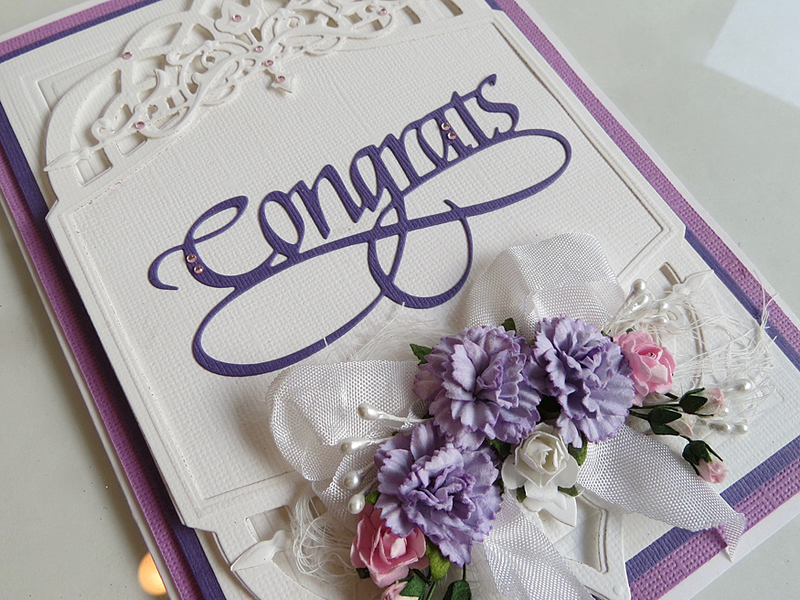 Today i made a card with the Congrats Way with Words die. It's a simple card with embossed dies and flowers for the back round in pretty purples and white. 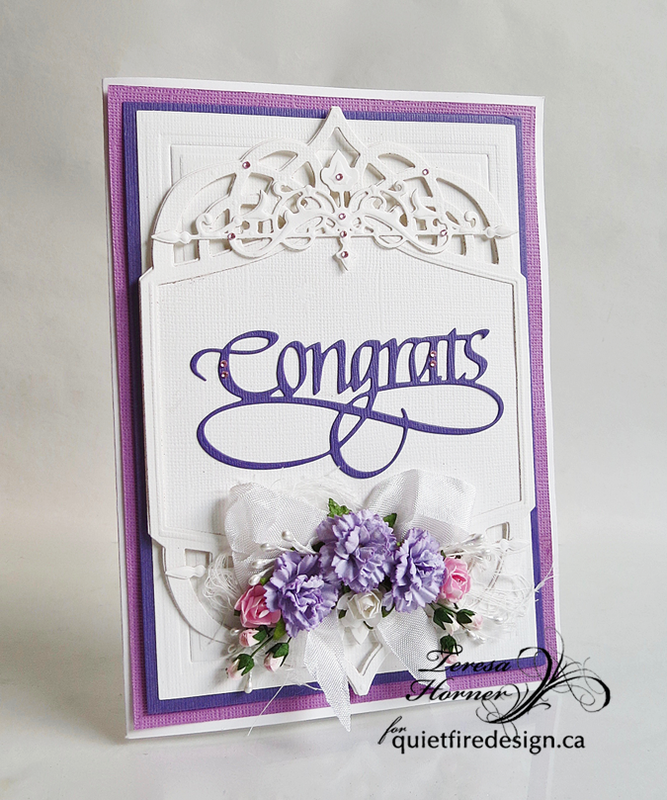 I love the Congrats die because there is so many ways that you can use it. And it's really nice paired with some of the old and new sentiments in the stamp shop. 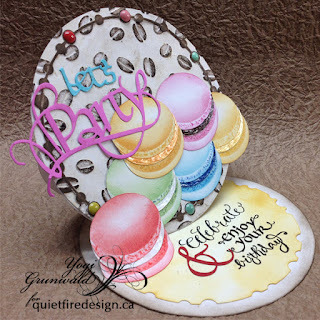 You can use the dies with just cardstock or try inking it up like a rainbow or even stamping clear ink on top and embossing with clear embossing powder to make it stand out even more. 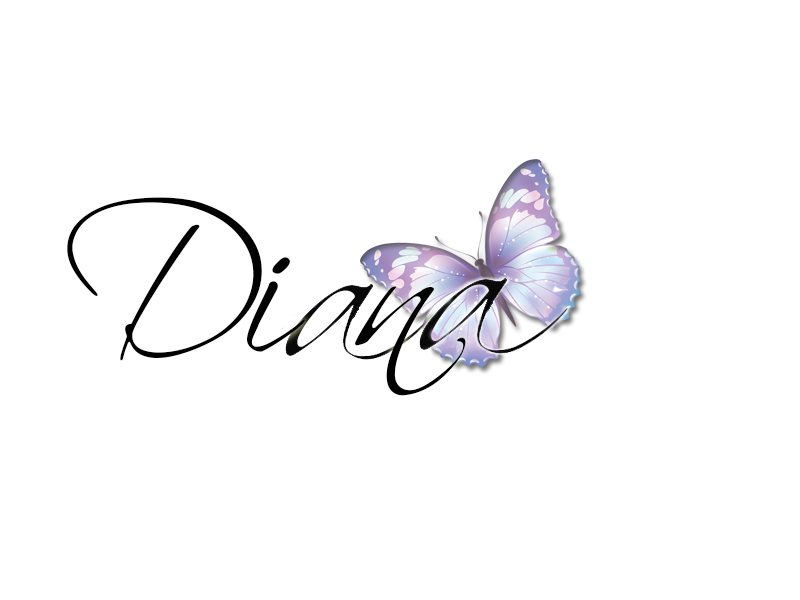 I added tiny little rhinestones on the letters in a few places to pop it out a little more and a few on the back round to make it more sparkly. Everything is better with bling!! Here is a closer look at the die and the flowers that i put at the bottom. Yvonne loves flowers so i thought i would do some pretty ones at the bottom for her. Thanks so much for stopping over and be sure and check back for more ideas and inspiration from all of us next week... Can't wait to share all the fall cards we have for you!! 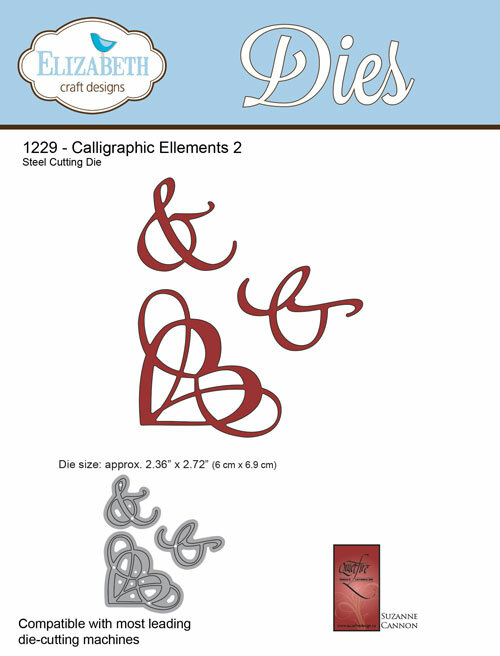 Mr and Mrs, Calligraphic Elements 2-ACT honoring Yvonne and Harrie! and her beloved Harrie on the occasion of their wedding! 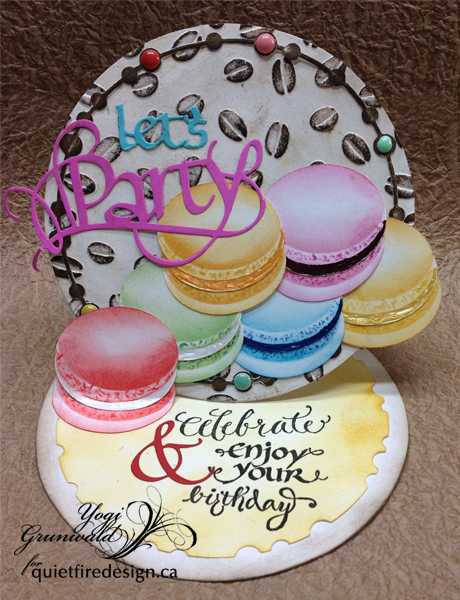 The new dies from the A Way With Words collection by Suzanne Cannon, some ECD silk glitter and soft finish cardstock cut to ATC size is all it takes to commemorate the day! More love-by-ACT with the same dies on my blog! Congratulations to all who love! 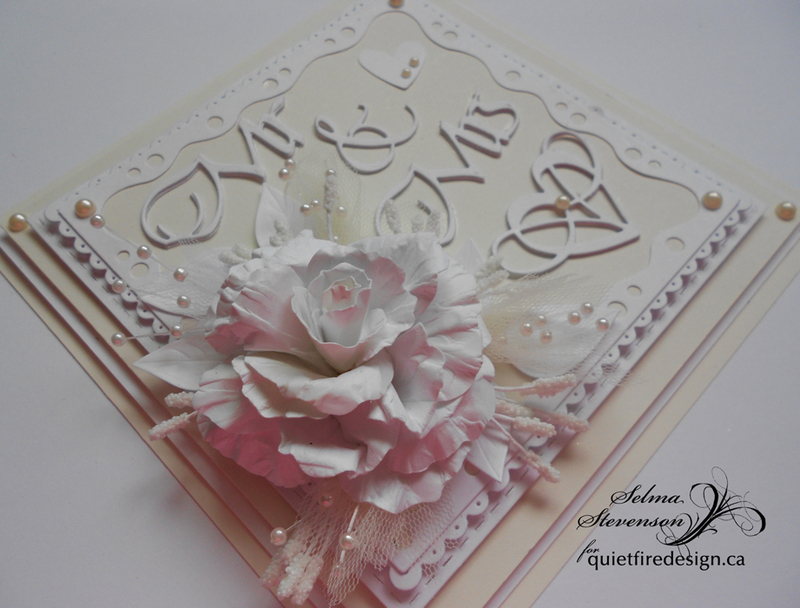 In keeping with the Quietfire Creations design team's celebration of one of our own team members, this wedding card was design for Yvonne and Harrie over in the Netherlands. This is their wedding day and we want to Congratulate them. 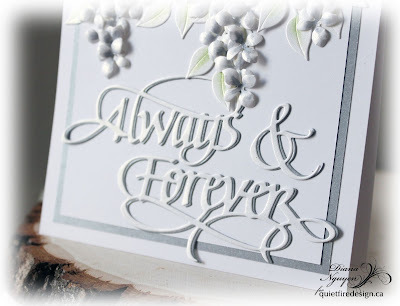 There is nothing more beautiful than a calligraphy written sentiment for a wedding card. Good Morning. 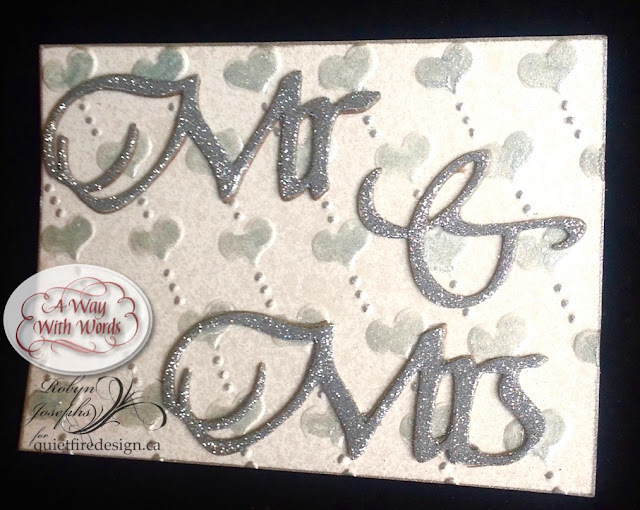 This is Selma today and I have designed a wedding card using Suzanne's new A Way With Words Mr Mrs and Calligraphic Elements 2 die sets. Here is how the card was created. To give dimension to the die cut pieces, three sets were die cut and glued together. By stacking the die cuts, it really gives them dimension and helps them look even more beautiful. In the picture below, you can see the height of the die cut sentiment and elements. This is a 6x6 inch card. 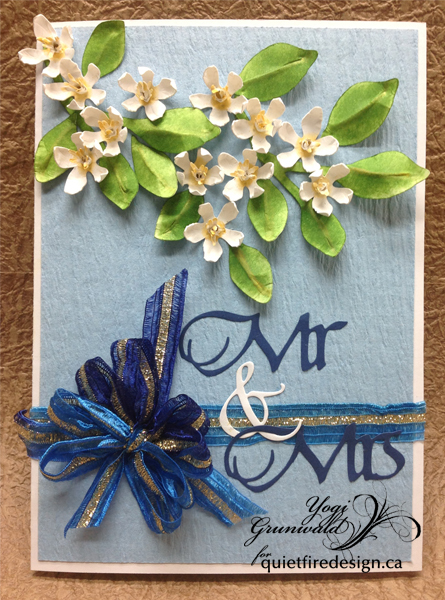 I have used both white and cream colored card stock. For the frame, Elizabeth Craft Designs Stitched Square, Dotted Scallop Square and Fitted Frames 2 Lace Squares die sets were used. Dimensional tape was used behind the Stitched Square, and Dotted Scallop Square for dimension. 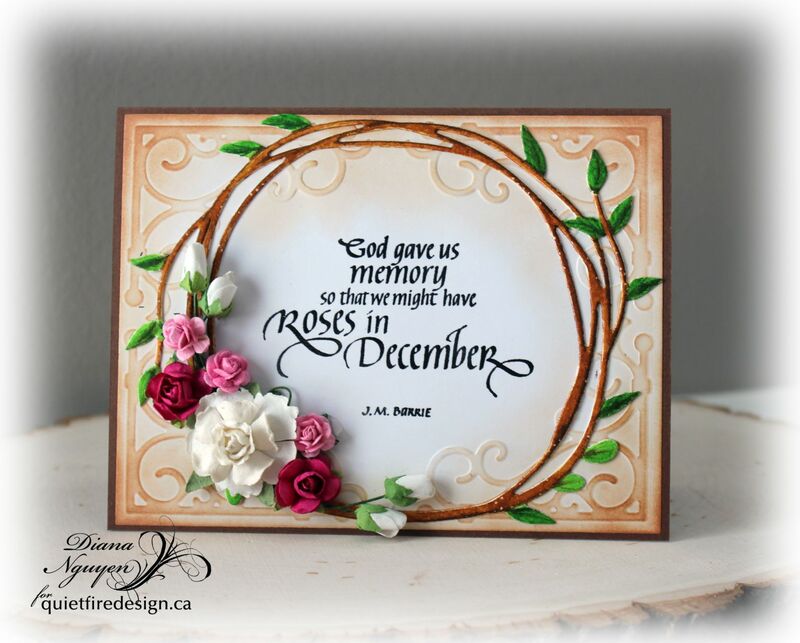 For the flower, Susan's Garden Notes Rose 1 die set was used to create a pretty rose. Elizabeth Craft Designs Big Triple Leaf die set was used behind the rose and craft store purchased wedding pearl elements tucked in behind the flower. 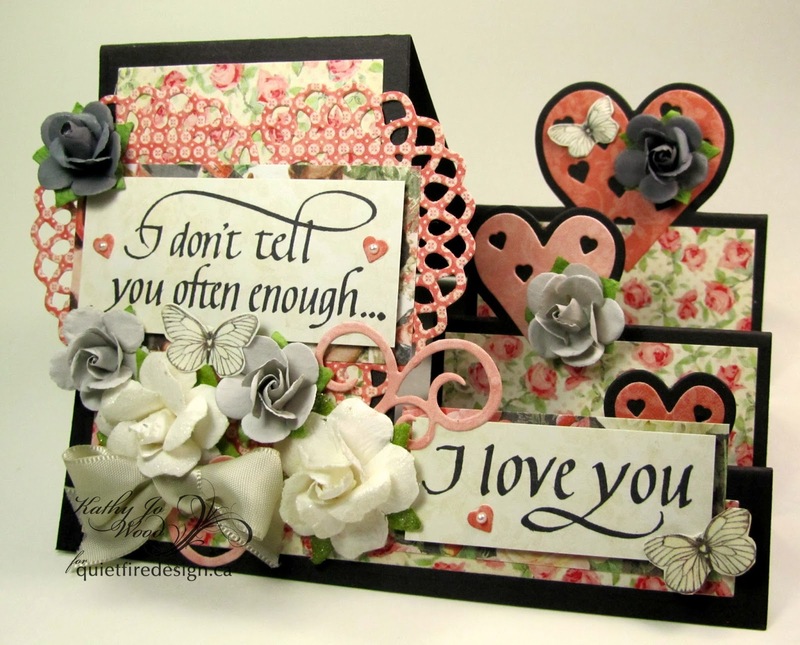 The small die cut heart is from the Fitted Frames 2 Lace Squares die set. 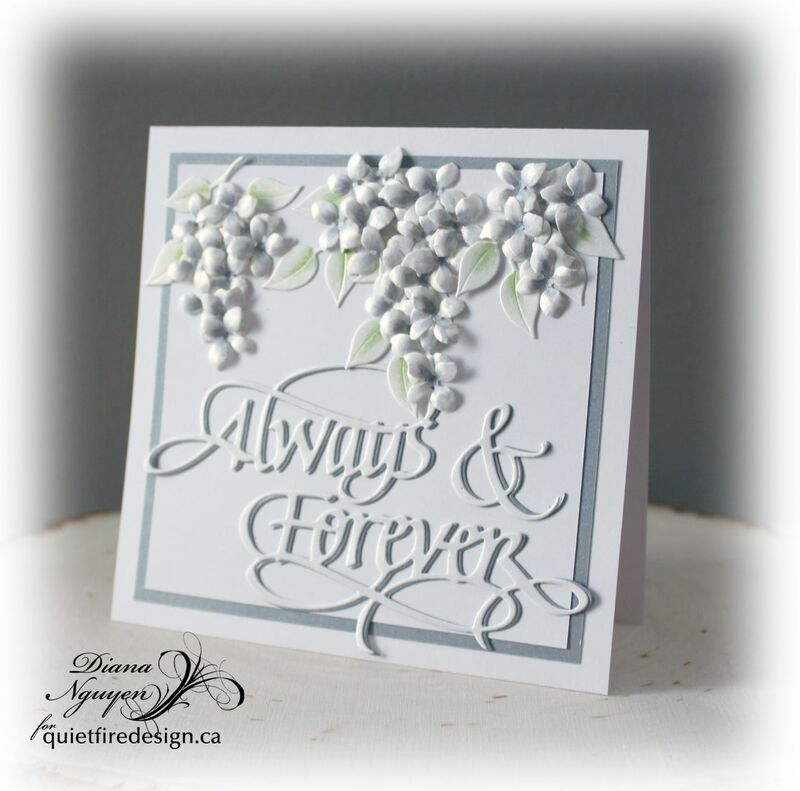 To finish the card, cream colored flat back pearls were added. Don't you love that gorgeous die cut sentiment and calligraphic element on the wedding card! 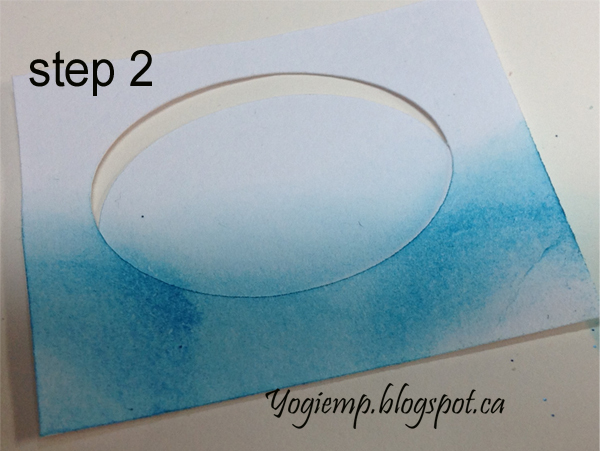 Step 2: Cut pattern papers to size and adhere to card front. 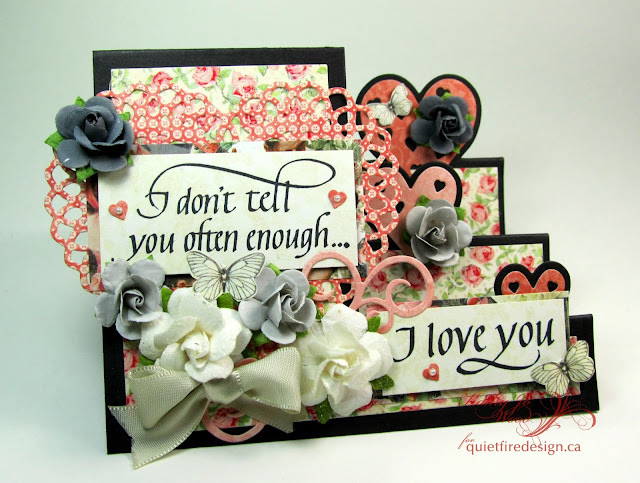 Die cut heart and adhere. Step 3: Stamp both sentiments on ivory card stock and cut to size. Mount on patterned paper. Step 4: Adhere flowers, fussy cut butterflies, bow and pearls as desired. Lots of love and best wishes to Yvonne and Harrie! I hope your life together is better than you ever dreamed! HUGS!!! Forever - Love - Hand in hand life's journey begins. We’re pretty excited over here at Quietfire Design. One of our own is being married this week! Congrats Yvonne van deGrijp!!!! Yvonne is marrying the love of her life, Harrie, in the Netherlands – in a windmill... tomorrow. Very romantic!! She’s so excited! This week we’re celebrating her happy event with a collection of well wishes! Congratulations Yvonne and Harrie! Have a wonderful day. We wish you all good things in your life together. 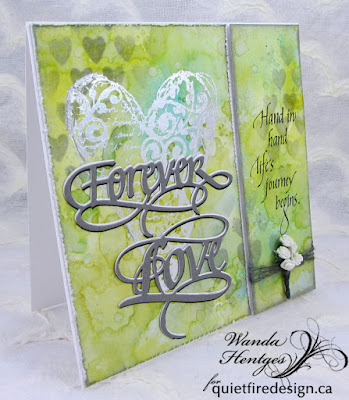 For the background of my card I've used Distress Inks (various greens including evergreen bough which brought in some blue-green) applying them to white cardstock using the wrinkle free distress technique, dipping and drying until I liked what I had. 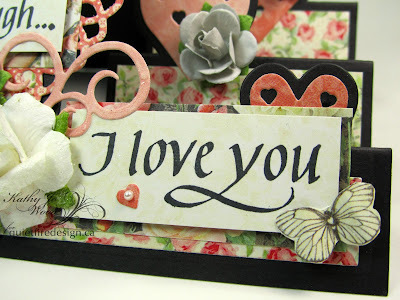 Next I stenciled hearts (Tim Holtz Stencil) with Distress Ink Hickory Smoke. I added a heart rub-on adhesive (Prima, Christine Adolf) to the left side of the paper applying silver foil over the adhesive. At this point I decided to cut my background into two pieces, edged them with hickory smoke and distressed the edges of the heart piece. "Forever" and "Love" were cut from grey, white, and black cardstock, layered together as shown and attached to the heart piece. This piece was attached to the folded white card. 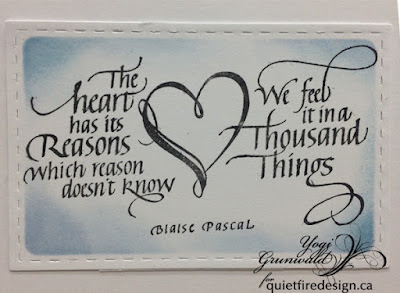 The other piece of background was stamped with the Hand in Hand quote using Archival Ink jet black. I wrapped grey twine around the bottom and tucked in a little bouquet of roses. This piece was attached to the folded card with foam mounting tape. Scored and side folded my white cardstock. Layered a piece of light blue Ruche cardstock leaving a 1/8" border all around. 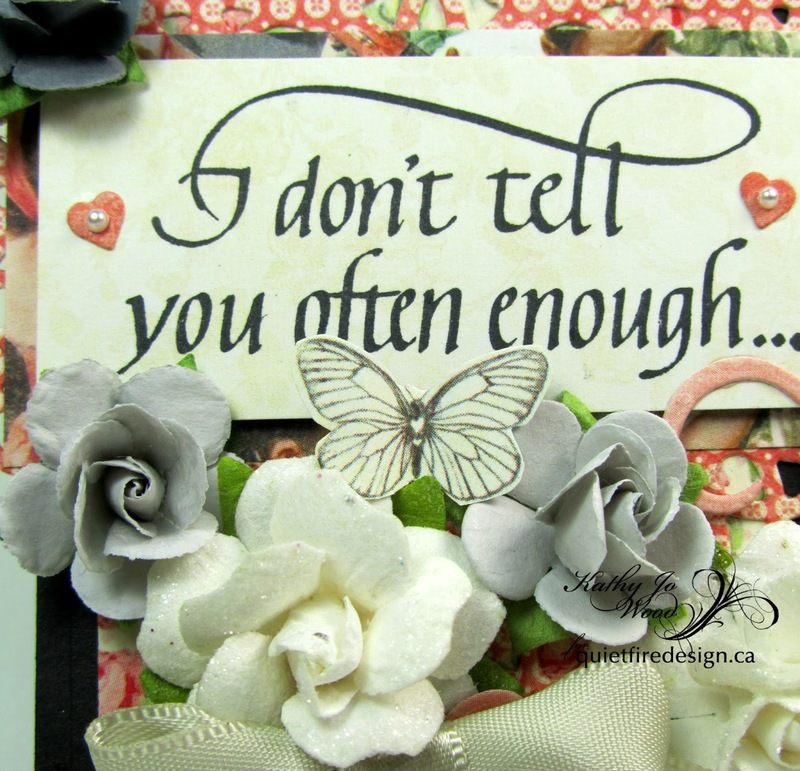 Created my flowers from 65# Soft Finish cardstock, using the smooth side. Tooled the flowers and added a dot of ochre Pan Pastels. 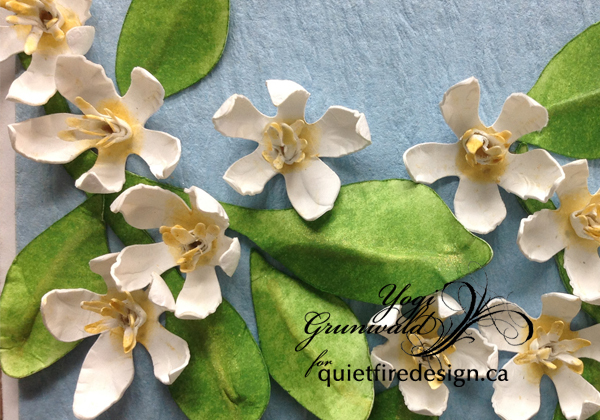 Added some ochre pastels to the stamen tips, rolled the die cut and adhered to the center of the Jasmin. The leaves I colored with Distress "Mowed Lawn", both sides, tooled the vein and added a stroke of the ochre to the high point, then tooled the tip. Adhered all the flowers onto the leafy branches. Adhered a piece of blue/gold Sari ribbon and tied a multi loop fork bow. 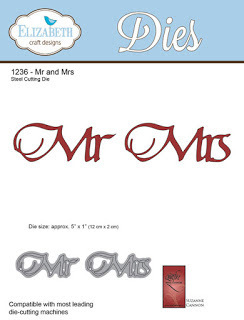 Die cut the "Mr, Mrs" from a deep blue cardstock and the "&" from the white. 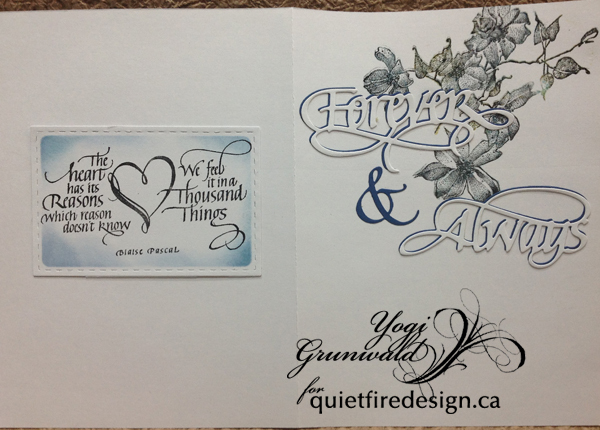 On the inside left: Stamped the quote on white cardstock using Versafine Black Onyx and clear embossed. 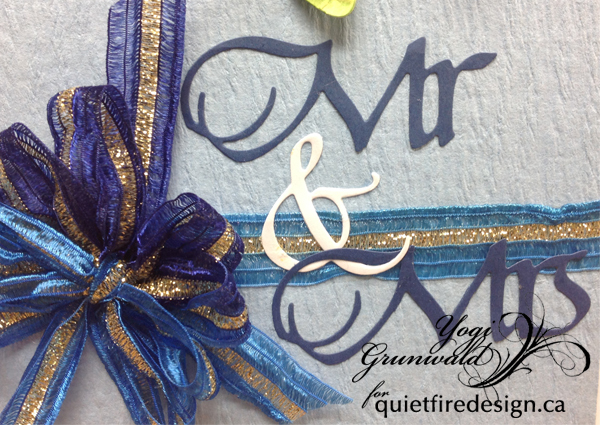 Die cut using a Stitched Rectangles die set (Elizabeth Craft Designs), Sponged some blue around the edge and adhered to inside of card. 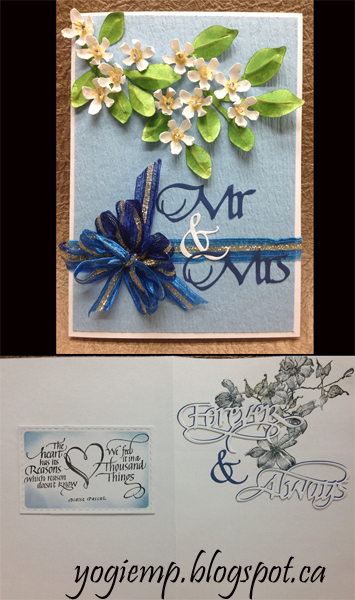 Inside right: Stamped the flower sprig (Flourishes "Bees and Blooms") using Distress pads in blues and greens, misted with water and stamped. Inked the stamp again using Black Onyx and stamped again. 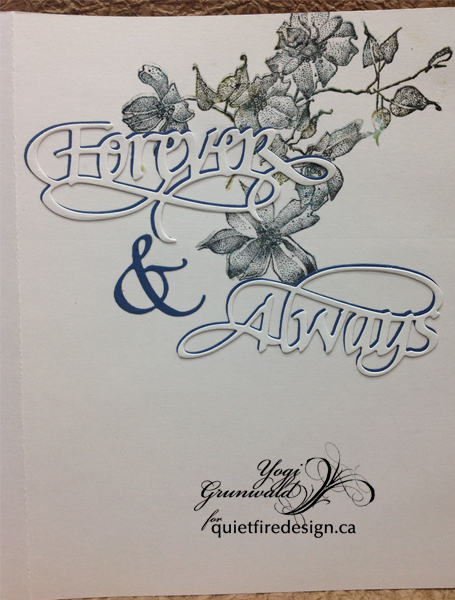 Die cut the "Forever & Always" from the deep blue cardstock and then the words from white cardstock. 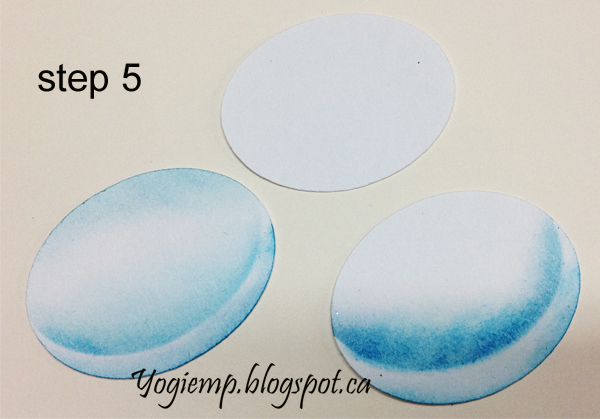 adhered the words offset to the blue layer, then onto the card. Yvonne has given us an idea of what her elegant and gorgeous wedding is going to be like so when I made this card, I kept the colors white and grey. 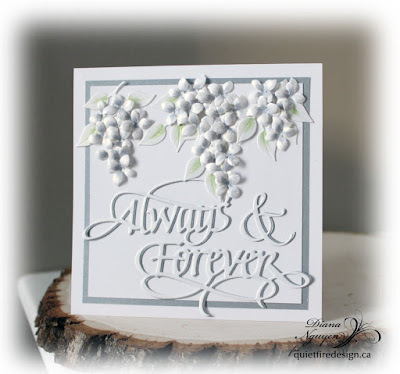 I die cut out the Always & Forever out of white shimmer card stock and grey card stock. The hydrangeas and curvy leaves by Elizabeth Craft Designs were also cut out of the same shimmery card stock though I did add a touch of grey and green with my lightest Copic markers. The Always & Forever die cuts were glued together with a slight offset for a shadow effect and the hydrangeas were clumped together to look like wisteria. 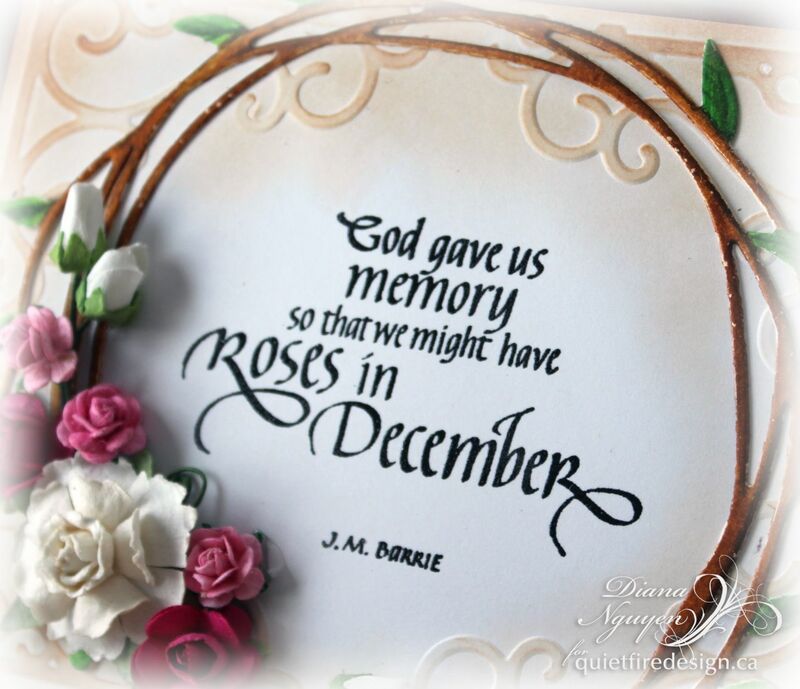 Thank you so much for looking and I hope you join me in sending beautiful thoughts and wishes Yvonne's way! 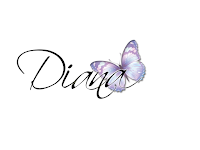 Always and Forever - New Dies!